I’ve been meaning to post this for six months, but a trip to Vijays sister restaurant in Wembley and Toby Young’s flattering review in The Independent on Sunday reminded me to do so. 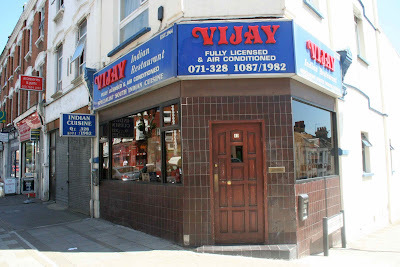 To continue with my exploration of restaurants in Kilburn, I finally got to try out Vijay, an established old school South Indian restaurant at the Kilburn end of Willesden lane, having passed by so many times. This place is not exactly flocked wallpaper but it hasn’t been tarted up; it has lisping service and plain decor, with a row of bain marie’s containing various curries running down the middle of the restaurant. They had a lunch deal, a buffet for a good price but I decided to order a la carte. 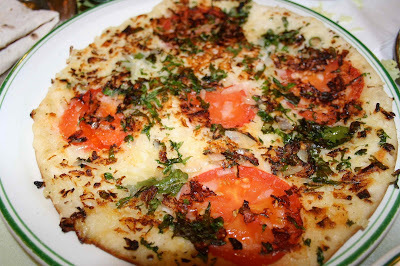 Uthappam is a cross between a curried pizza and a pancake, made out of ground rice flour, a typically Southern Indian dish. 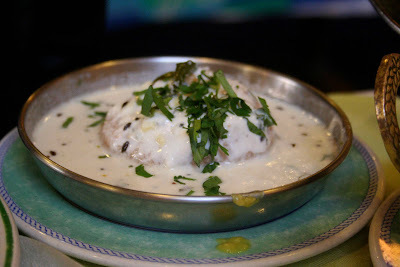 The vadai, doughnuts covered in yoghurt were good, I must declare I preferred my own version. 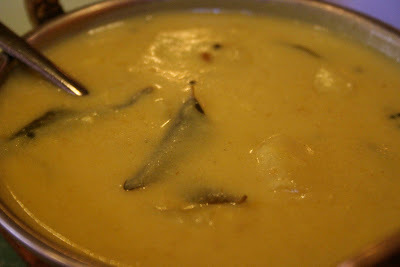 The two curries pictured here look identical but aren’t: dahl and Keralan Dhai curry? Lemon rice was a nice change to pilao and breads, Puri and Chapati, were not bad. The Salt lassi was one of the best I have had. Bill was reasonable approximately a tenner each without wine. Geeta is another good South Indian choice on Willesden Lane; like eating in someone's front room but delicious, and cheap as chips. Aaah, lovely Vijay, actually my favourite local restaurant and one I've enjoyed for more than 20 years. So glad you finally made it. They do make the best salt lassis of all time! Did you notice that the wooden ceiling inside is fitted out to look like a Keralan house? Delightful. 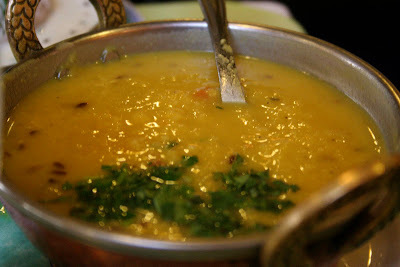 I ate once at Geeta, on one of the rare occasions that I couldn't get a table at Vijay. Geeta was good, and extremely cheap, but the tarka dal wasn't a patch on the unctuously delicious Vijay version. Vadai! You get those doughnut ones in Sri Lanka and also lentil vadai, my favourites. 20 rupees each at grubby little roadside stalls, they have been my between-meals fuel for the past two weeks but I prefer the ones my old flatmate and travel guide used to make for us as study snacks. Luckily I have her recipe.